CarGurus has 1,140 nationwide Shelby GT350 listings starting at $37,475. A now-standard Track Package, three new colors, and a reworked Electronics Package mean the most capable Mustang in history has gotten even better for 2017. With the Track Package now standard on all 2017 GT350 trims, there’s little compromise left in this successor to Shelby’s original creations. 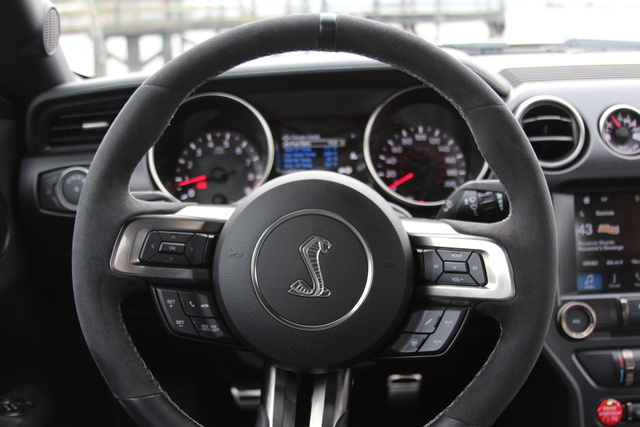 A MagneRide adaptive suspension, heavy-duty front springs, strut bar, intercoolers, and drive-mode select mean the GT350 is guaranteed to have the handling chops to deal with the auspicious flat-crank Voodoo engine. With a reworked Electronics Package now adding dual-zone AC, satellite radio with an upgraded stereo, and an 8-inch touchscreen with navigation and voice activation, the GT350 is truly a race-and-drive-home sports car. It sure looks like a Mustang at first. With a quick glance, you might even fool yourself into thinking it is a Mustang. But it’s not. Looking past the spoilers and the stripes, the sport seats and the stance, there’s a different engine, transmission, suspension, and braking system. This is a Shelby. Even with the base version, the GT350 is a formidable performer on the track, and that’s doubly true this year with the addition of the standard Track Package’s adaptive suspension and related upgrades. That’s because the GT350 takes the already-impressive 5.0-liter Coyote engine that powers the current Mustang and transforms it into something altogether evil: a fire-breathing, bored-and-stroked, rev-happy banshee that screams its way to an 8,200-rpm redline, making 429 lb-ft and 526 hp along the way. This engine is the first reason the GT350 simply isn’t a Mustang. A flat-plane crank with fully opposed throws means the 5.2-liter engine revs, breathes, and sounds like no engine that’s ever powered a Mustang. Because the throws are spaced at 180 degrees like in a 4-cylinder motorcycle engine or a V8 Ferrari rather than at 90 degrees like you’d find with a cross-plane crank in a traditional American V8, the crank itself and its related counterweights are lighter, allowing for less rotating inertia and faster revving. Plus, it does something to the exhaust pulses that goes beyond my understanding. What I do know is that it results in a sound wholly unique to Mustangs. The second reason the GT350 feels unlike any Mustang that came before it is that adaptive suspension. Mustang suspensions have been through a lot of late. After 50 years of solid rear axles, the Mustang started sporting an independent rear suspension in 2015. With the addition of the MagneRide adaptive dampers, the versatility of the GT350 takes a giant leap forward. Beyond its ability to soak up imperfections in the road and deliver consistent contact, this also affords the GT350 drive-mode select, meaning you can select different settings depending on whether you’re lapping the track or just cruising along a less-than-perfect mountain twisty. That alone would set the GT350 apart and go a long way toward justifying its increased $56,145 MSRP (including a $1,300 gas-guzzler tax). But Ford didn’t stop there. 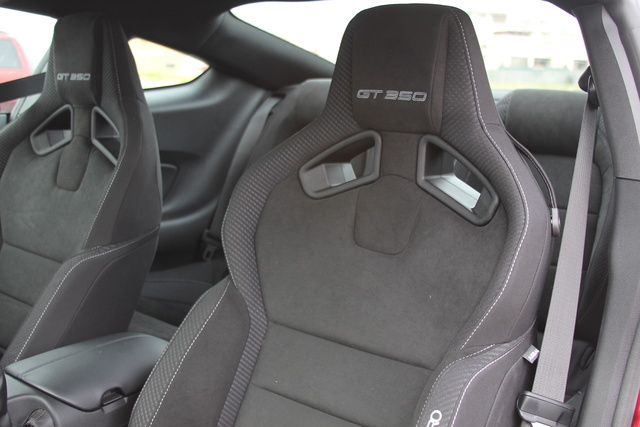 Recaro race seats and a flat-bottom steering wheel grace the inside, along with some updated switchwork and badging inside, including a chassis-code number plate on the dash. Otherwise things looks very familiar on the interior, including the Sync 3 interface if you option it. If that sort of performance doesn’t seem enough for you, the GT350R will save some extra compared to the GT350’s 3,800-pound curb weight by deleting the rear seats and radio and adding carbon fiber wings and wheels. That’s right, wheels. The GT350R is the first production car with carbon fiber wheels, and if that’s not special, I’m not sure what is. Of course, it better be with an MSRP of $63,645. 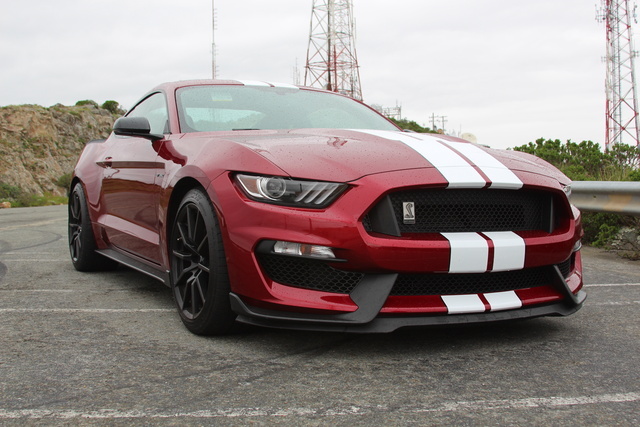 I spent a day on the track and a week with the GT350, painted in Ruby Red Metallic ($395), fitted with an “Over-the-Top Racing Stripe” ($475) and the $3,000 Electronics Package, which brought my drive-away price to $60,915. I really can’t say enough good things about the Voodoo engine in the GT350, but it’s more than just the blistering power and range of the engine. Below 3,000 rpm, the 5.2-liter V8 is completely streetable. Where most “race-ready” engines can spit and stumble at low revs, ready to deliver power only at full throttle, the Voodoo is composed and subtle at low speeds until you cross that threshold and start building that immense power. 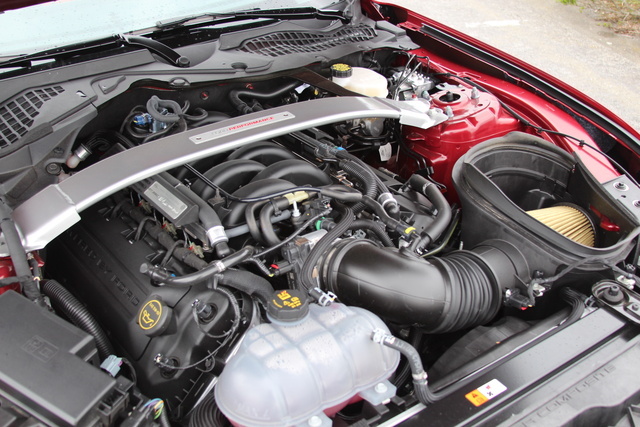 It’s part of what makes the GT350 so formidable—the versatility of this engine. Beyond 3,000, it’s nothing but useable power. With an 8,250-rpm redline, you’ve got more than 5,000 rpms of range to work with, and that’s a confusing proposition in a Mustang. Truthfully, it’s more than most public roads can handle, especially at legal speeds. On the track, I found myself thinking I needed to shift over and over again—surely I was approaching redline. But every time I looked down, I would find I had another 2,000 rpms or more of engine left. And it’s consistent power all the way to its peak at 7,500 rpm, where the final dose of oomph announces itself by punching you in the lower back yet again. Thankfully, the GT350 has the suspension and brakes to handle all that engine. The MagneRide adaptive dampers are able to keep all that power on the ground (along with a healthy dose of traction and stability control), and when it comes time to brings things to a stop, 15.5-inch, 6-piston Brembos up front and 15-inch, 4-piston Brembos in the back will bring things to a stop violently. We’re talking 100 feet to get from 60 to 0 mph. With bronze pins connecting the iron rotor and aluminum hat, they cool better as well. Despite not getting nearly as much attention as the engine, suspension, or exhaust, the brakes might just be the most impressive part of the GT350 package. What about fuel efficiency? Well, the EPA slots the GT350 at 16 mpg combined: 14 mpg city and 21 highway. Predictably, my own averages were significantly less over the course of a week’s mixed driving, but some longer stints on the highway tell me that those figures should be achievable theoretically—as long as you can keep yourself from driving it like it should be driven. That said, why pay a $1,300 gas-guzzler penalty if you’re not even going to take advantage of all that power? 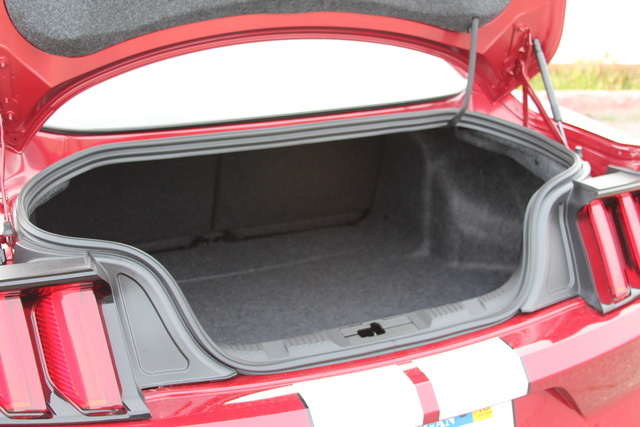 Are you looking for a steroid-laced ponycar with a nearly useless back seat? The GT350 should suit your needs perfectly. But while the back seats are suited only for very small children and luggage, the front Recaros are generous and supportive with cutouts for harnesses. I spent hours in the GT350 and never had any back issues, even when sitting in traffic or during long boring stints on straight highways. It’s a continued testament to the ability of the GT350 to perform equally well on the track and the street. Well done. But there have to be complaints, no? While the tech and performance seem worth every penny of its 60 grand price, for that kind of money I’d like to see less hard plastics and some unique switchgear. 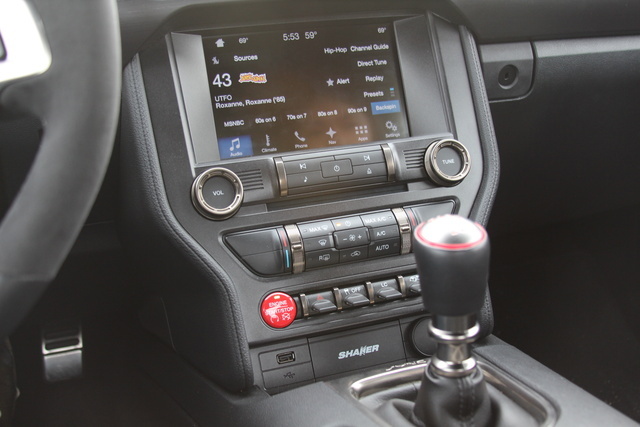 If I’m going to pay nearly two and a half times the purchase price of a V6 Mustang, I’d prefer they didn’t sport the same stalks and buttons. And while I’ve written and spoken at length about my aesthetic issues with the Sync 3 interface, they’re only exacerbated here. Do yourself a favor and switch the display to the “Night” settings all the time. It’s no harder to read during the day, and the color scheme matches the interior of the GT350 much better. Tech is in short supply here, and unless you add the Electronics Package, it’s nearly absent. If you check that $3,000 option, you’ll get dual-zone air conditioning, satellite radio with an upgraded stereo, and an 8-inch touchscreen with navigation and voice activation. As much as I complain about the Sync 3 system visually, it’s a functional system that should offer no headaches. The upgraded Shaker stereo provides ample power, but there’s a little button on the console to make the gorgeous exhaust even louder, so you may find the two competing with each other. It’s a wonderful problem to have. Probably the most attractive bit of tech in the GT350 is the Track Apps telemetrics system, allowing you to change viewable digital gauges as well as a G-force readout, lap times, 0-60 times, braking tests, and the like. Paired with launch control and line-lock, allowing you to activate the front brakes and smoke the rear tires (ostensibly to warm them up for the track), the GT350 is race-ready. Beyond the usual safety systems, a full suite of airbags including front knee, front-seat side, and side-curtain bags, and those astonishing brakes, the Ford Mustang has received top safety ratings in all tests by the government’s National Highway Traffic Safety Administration (NHTSA) as well as top scores in all tests from the independent Insurance Institute for Highway Safety (IIHS), barring the small-overlap frontal-offset crash test, for which the Mustang received the second-best rating. 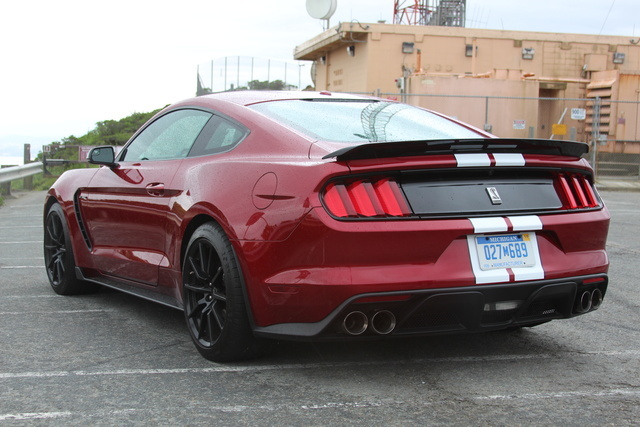 However, the GT350 itself hasn’t been independently evaluated by either organization. Cost effectiveness is a difficult discussion when you’re dealing with a $60,000 sports car. Is the performance offered worth the cash? 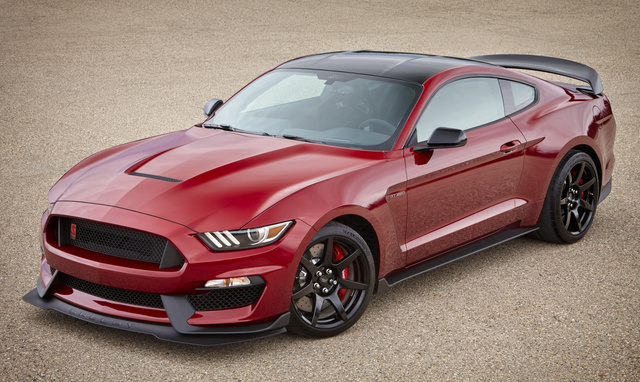 I believe it is, and I think the GT350 is currently the best offering from the pony-and-muscle-car competition. 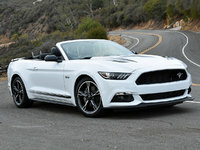 Putting it in context, the price for a Mustang and especially a unique Mustang like this has fluctuated wildly over the years. In 1965, a Shelby GT350 cost just $4,500, equivalent to around $35,000 in 2017 dollars. That’s the base price for a V8 Mustang today. But back in 2000, an SVT Cobra R would run you about $56,000 and get you nowhere near this kind of performance. With a $1,300 gas-guzzler penalty and fuel economy that’ll flirt with single digits unless you’re being a very good boy, it’s hard to argue the GT350 could ever be “cost-effective.” But if you want a car you can drive to the track, hammer all day, and then drive home, I’m not sure there’s a better option for less money right now. What's your take on the 2017 Ford Shelby GT350? St1ng Good review. I think Mike hit it on the head though with the comment about the interior. When a car hits the $70k price point, I expected a bit more than the base model interior. It's really not a step up from that. It's not bad looking and the seats are great, but it feels pretty cheap overall. Thomas It would be a bargain if dealers were willing to sell the limited number of GT350s available at anywhere near sticker price. But, they are not. Dealer near me wants $110,000 for one! Users ranked 2017 Ford Shelby GT350 against other cars which they drove/owned. Each ranking was based on 9 categories. Here is the summary of top rankings. Have you driven a 2017 Ford Shelby GT350? Looking at used shelby gt350s with 5k miles on them even tho it's used will I have to pay a gas guzzler tax or is that tax only for when you buy brand new? Does The Mustang Gt350 Only Come In A Manual? What does the " last contacted with Date " indicate ... Some Pcs are showing in my advanced search but not in the Dealers Ford based New Inventory data base?